The Pimsleur programs provide a method of self-practice with an expert teacher and native speakers in lessons specially designed to work with the way the mind naturally acquires language information. The various components of language -- vocabulary, pronunciation and grammar -- are all learned together without rote memorization and drills. Using a unique method of memory recall developed by renowned linguist, Dr. Paul Pimsleur, the programs teach listeners to combine words and phrases to express themselves the way native speakers do. By listening and responding to thirty minute recorded lessons, students easily and effectively achieve spoken proficiency. No other language program or school is as quick, convenient, and effective as the Pimsleur Language Programs. The Comprehensive Program is the ultimate in spoken language learning. For those who want to become proficient in the language of their choice, the Comprehensive programs go beyond the Basic Programs to offer spoken-language fluency. Using the same simple method of interactive self-practice with native speakers, these comprehensive programs provide a complete language learning course. The Comprehensive Program is available in a wide variety of languages and runs through three levels (thirty lessons each) in French, German, Italian, Japanese, Russian and Spanish. At the end of a full Comprehensive Program listeners will be conducting complete conversations and be well on their way to mastering the language. The Comprehensive Programs are all available on cassettes and are also on CD in the six languages in which we offer the Basic Program on CD. I secretly bought these tapes and listened to them in my car. 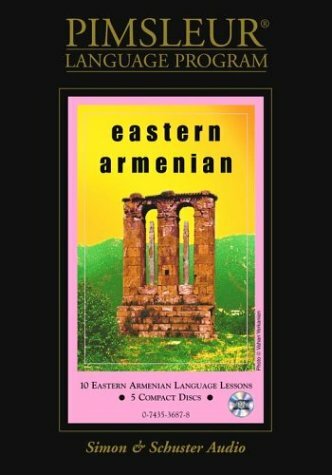 The first time I spoke Armenian to my future inlaws (Armenian is their first language) I almost had to pick my future mother-in-law up off the floor! I was thrilled with the result! I would recommend this program to anyone! A perfect way to get the flavor of the language, and form a basis for further study. A perfect way to get the flavor of the language, and to form a basis for further study.